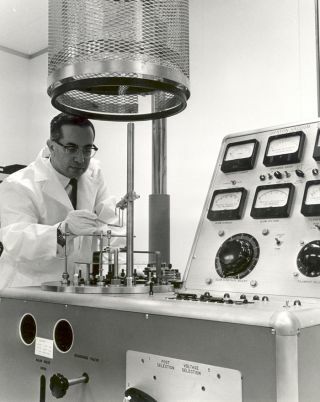 Seymour Schwartz prepares substances to be analyzed for evaporation properties at the ERC in the late 1960s. In this historical photo from the U.S. space agency, this vacuum evaporator was used to aid in designing high reliability mirco-electronic circuits for long-range NASA missions. Here, Seymour Schwartz of the Qualifications and Standards Laboratory deposits substances that will be analyzed for evaporation properties. The ERC opened in September 1964, taking over the administration of contracts, grants, and other NASA business in New England from the antecedent North Eastern Operations Office (created in July 1962), and closed in June 1970. It served to develop the space agencys in-house expertise in electronics during the Apollo era. A second key function was to serve as a graduate and post- graduate training center within the framework of a regional government-industry-university alliance. Research at the ERC was conducted in ten different laboratories: space guidance, systems, computers, instrumentation research, space optics, power conditioning and distribution, microwave radiation, electronics components, qualifications and standards, and control and information systems. Researchers investigated such areas as microwave and laser communications; the miniaturization and radiation resistance of electronic components; guidance and control systems; photovoltaic energy conversion; information display devices; instrumentation; and computers and data processing. Although the only NASA Center ever closed, the ERC actually grew while NASA eliminated major programs and cut staff in other areas. Between 1967 and 1970, NASA cut permanent civil service workers at all Centers with one exception, the ERC, whose personnel grew annually until its closure in June 1970.